John Ise was born the eighth of eleven children to Henry and Rosa Ise, June 5, 1885, on a farm three miles northwest of Downs, Osborne County, Kansas. Ise received his Mus.B. in 1908, his A.B. in 1910, and his L.L.B. in 1911, all from University of Kansas. He received his A.M. in 1912 and his Ph.D. in 1914, both from Harvard University. He joined the University of Kansas faculty in 1916, reaching full professor status in 1920. 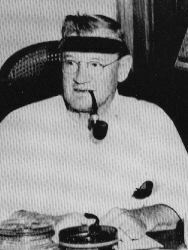 He retired in 1955. His eight books ranged in subject matter from a collection of humorous comments on current conditions to comprehensive test on economics, interspersed with the classic story of his pioneer family in Osborne County. His great generosity is reflected in several gifts to aid university students and to the city of Lawrence, Kansas, to build and support a humane animal shelter. He served as president of the American Economics Association, the Mid-West Economic Association and served on the editorial board of the American Economic Review. He was a world-renowned economist and is still remembered to be one of the three greatest professors in University of Kansas history, even after his death in March 1969. Sod & Stubble, New York: Wilson-Erickson, 1936. Later editions came out from Bison Books, 1967, and an unabridged and annotated edition from the University Pressof Kansas, 1996, ed. Von Rothenberger. 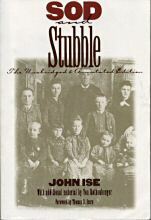 Sod and Stubble, John Ise's most well known work, is a record of the adventures and adversities of his childhood as a homesteader of Osborne County, Kansas. In this book he takes the reader from the 1870s to the turn of the century showing the ups and downs of life as a homesteader in Kansas. The fires and droughts, parties and picnics, insect infestations and bumper crops, prosperity and poverty, divisiveness and generosity, births and deaths are all a part of what shaped the lives of Henry and Rosa Ise, their family, and their community. For more about Sod and Stubble, see kansaspress.edu's article. 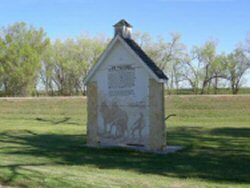 This attractive sign in Memorial Park, along Highway 24, pays tribute to the book Sod and Stubble, written by John Ise, who wrote of his parents who homesteaded northwest of Downs in the late 1800s. 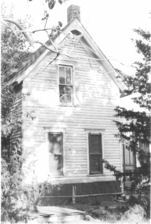 The book has become noted in historical circles as an excellent written account of that period of time in rural Kansas. "Over the years, I have recommended this book to hundreds of people in all walks of life and of almost all ages. Many have declared it to be most informative and most interesting book they have read about Kansas history. --Leo E. Olivia, author of Woodston: The Story of a Kansas Country Town. Of the Von Rothenberger edition: "A first rate edition. The annotations are informative in content and graceful in style." --Susan J. Rosowski, general editor of The Willa Cather Scholarly Edition.